This is a Chinese name; the family name is Du (Tu). 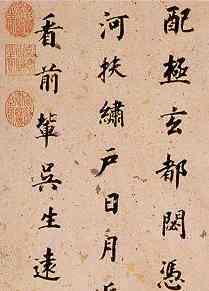 Du Fu (Chinese: 杜甫; pinyin: Dù Fǔ; 712-770 AD) was a Chinese realistic poet. He was also called Zi Mei. Du Fu is often regarded, along with Li Bai and Wang Wei, as one of the three greatest poets in China's literary history. He has been called Poet-Historian and the Poet-Sage by Chinese critics. Today we know about 1,400 of his poems. His poetry describes human suffering that he had witnessed throughout his life. 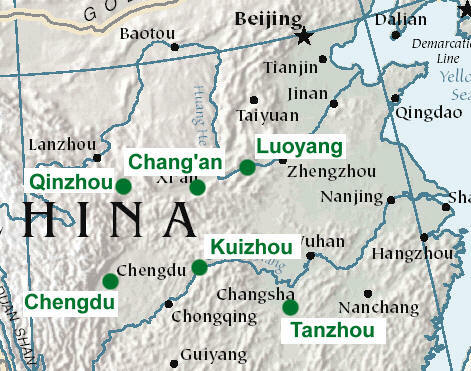 It also reflected on the troubled times during the Tang Dynasty. In 755 he was forced to flee his home and was separated from his family for a year. Du Fu Facts for Kids. Kiddle Encyclopedia.